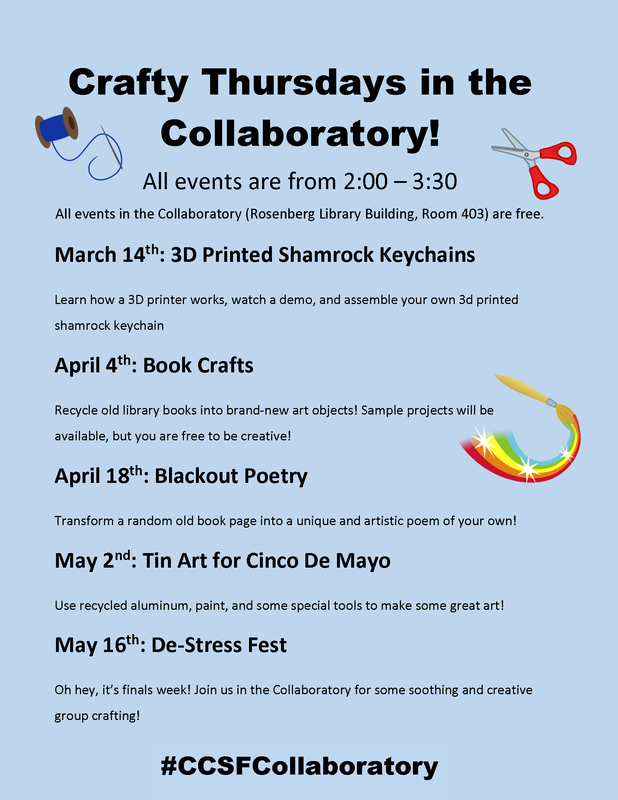 Crafty Thursdays in the Collaboratory! 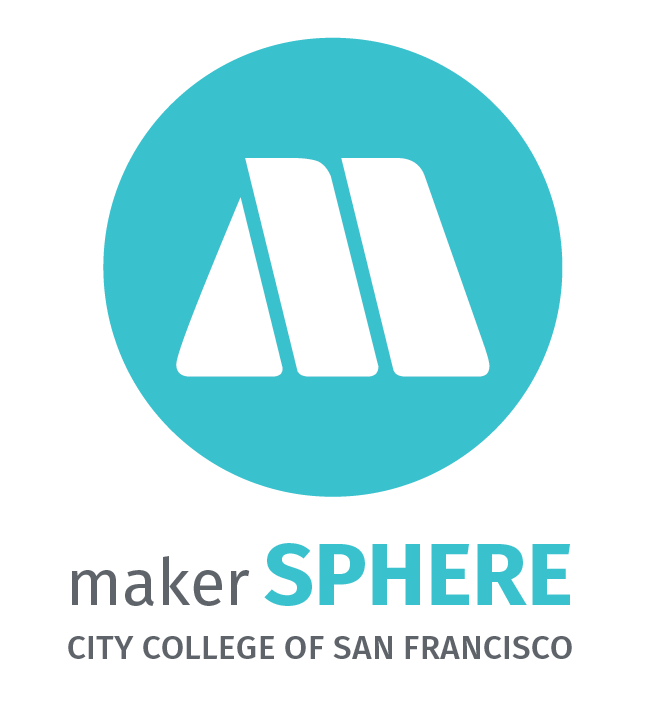 The MakerSPHERE is a collection of makerspaces in three locations on two different CCSF campuses: The Collaboratory (Ocean Campus), The SMART Makerspace (Ocean Campus) and The Industrial Makerspace (Evans Center). Each space is part of a collaborative networked hub. Two Maker courses, MAKR 100: Introduction to History, Culture and Practices of Making and MAKR 400: Maker Capstone are being developed for the 2018-19 course catalog. The Collaboratory is one of three maker-focused spaces at CCSF. Located at Ocean Campus in the Media Center of the Rosenberg Library, the Collaboratory is a space for “clean” maker technology such as 3D printers, computers with 3D design software, drafting and design tools, Raspberry Pi and other single-board computers, and also for collaboration and idea sharing. While the space is still in flux, the library is in the early phases of planning and acquiring the necessary equipment to facilitate a makerspace. We have two MakerBot 3D printers, a collection of maker-focused books, and computers with 3D modeling software. In the coming months, there are plans to outfit the space with new furniture and rearrange the existing setup to be more conducive to collaborative work. We are still acquiring materials and tools for the Collaboratory, so any suggestions on how to improve the space are welcome! Blender fundamentals: Blender is a popular free 3D modeling software, used to create 3D models that can be sent to a 3D printer. Blender Fundamentals is a series of 41 short videos on various aspects of 3D printing. This is a good place to start if you're new to 3D printing. Shapeways tutorial: Shapeways is a New York-based 3D printing company that lets users submit 3D printing orders in a wide range of materials. Have a piece of jewelry you've designed, or want to design? You can send it to Shapeways, who will print it in plastic, stainless steel, or even gold. Below is a set of videos meant for 3D design beginners. Thingiverse: Thingiverse is Makerbot's repository for user-generated 3D design files. The site has hundreds of thousands of user-generated designs, from tools to toys to art. Users can choose which type of sharing license they wish to upload their files with. Beginner's Guide to 3D Printing: A guide on the fundamentals of 3D printing. It covers the history of 3D Printing, different printing processes, software and hardware, etc. For users who are considering getting their own 3D printer, there are also tips on purchasing and maintaining a machine. What Can You Make With a 3D Printer? : You think 3D printers are cool and you want to use one, but aren't sure what they can be used for? This video shows five practical items that can be made easily with a 3D printer.